forgotten that trip in particular, even though I have visited this convent dozens of times." 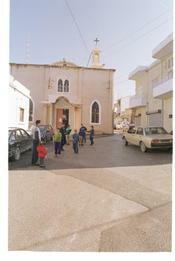 "The church was packed with people from Mieh W Mieh and the surrounding villages, both Christians and Muslims. Bishop Salim spoke at length about your father's values and his lifelong struggle for peace, justice, and equality. He reminded the Audience that Elias, born Christian, had all the love, admiration and care for people of all denominations. He then added that the walls and columns of the village church are a testament to his engineering skills." Note - my father designed a distinctive parabola-shaped roof for the church in 1964. It was made of reinforced concrete, and to the consternation of the village, had no support pillars. Didn't need them. His father begged him to put some in, because if the roof caved, the family would be dishonored in the eyes of the community. Twenty years later the church took three massive mortar shells to the roof, was then abandoned for six years after the village's destruction. The roof survived, and when the people returned after the Taif accords, they merely patched up the holes. Another report continues: "Father Ghazal (i.e. Bishop Salim Ghazal) also spoke of Mary, Elias’ wife, and her commitment to the people of Lebanon, her returning to teach at AUB before she retired, and Elias’ and Mary's joy in being able to live in Lebanon for eight years after he retired. Father Ghazal spoke lovingly of their beloved children Leila and Khalil." Among the church attendants was ex government minister Ali Osseiran and several Ghandour family members coming from Nabatieh & Beirut, as well as several people coming from Ghazieh, Maghdousheh, Saida, Beirut and elsewhere. Before the mass, Simaan had ordered the traditional bereavement cookies from a bakery, and they were delivered to the church and placed at the altar where they were blessed by Father Ghazal during the service. As soon as the Mass ended, a small table was moved to the center of the altar, and a large black velvet cloth was placed over it (signifying a person lying there at the altar who had died), and a gold cross was placed on top of the black cloth. At the end of the Mass, young teen-agers took those cookies (each separately wrapped) to the exit doors, and gave one to each person leaving. After the Mass, the family went to the Fellowship Hall of the church where the church members came and spoke to the family, and offered condolences. Coffee was served. People then continued to come to Simaan’s home in the afternoon. Leila's note: Father Ghazal, abbott of the exquisite monastery of Deir MKhalles near Joun, was a particular friend of my father's. During my 2000 visit to Lebanon, I went to the monastery with my husband, infant son, and parents; Father Ghazal blessed my child with a simple gesture to the forehead, and I have a picture of him holding the baby and smiling. I will try to get these pictures scanned and posted. Thanks to my cousins Asma in Mieh-Mieh, Camille in Dubai, Nabil in Qatar, my uncle Semaan in Mieh-Mieh, and my mother in Alameda, who contributed the accounts compiled into this post. Note: We are organizing a service in Alameda, Ca for Sunday October 8 (not positive yet). Watch this space for details. There may be a service in Greensboro, NC as well. Stay tuned. I was greatly moved by the thought of so many people, so far away, coming together in that beautiful church to honor the remembrance of Elias. This speaks eloquently of their love and respect for him as a son of the village. I wish we all could have been in Mieh Mieh. I thought of your father - my uncle - all weekend. He was such a good person and so intelligent! There will never be another such as Uncle Elias. He was always interested in me and in my career as a computer analyst and in some of my jobs I held with NASA. Some may not know but I think he designed some of the International Space Station pieces and parts - truly an engineering genius. He and Mary Edith also visited us in Denver as they came through the area on train in August of 2000. It was exciting to have my honorable Lebanese Uncle and Aunt Mary Edith visiting us - and my children still remember his writing their names for them in Arabic. So now - how do you say "Peace" in Arabic? I have been so saddened about the news of Uncle Elias's passing. I really have been in somewhat of a state of disbelief, because we all got to spend such precious and memorable moments just a short time ago (less than a week ago). It's so difficult to comprehend. I think back over the many years I have had a special affiliation with the Abu Saba family. We have been through so many wonderful events together! I think about the trips to Peoria, Illinois and to North Carolina and my very recent trip to California! All trips were wonderful in one fashion or another. Uncle Elias was a truly remarkable and striking human being. He added so much depth and color to our Bentley family. There will never be another human being like him, but I will treasure all the things he did to add specialness to all that he did. I will recall how he loved family and the lengths he'd go to just to see someone!! I think back also as to the many Arab relatives he and Mary Edith sponsored as they began their lives in America. And, now look at the multi-cultural world that has now evolved. He taught us how to love peoples of all nationalities, and he taught us how to be understanding of their many religious ways, even if they weren't the same as ours. He was the first one to open my eyes to this understanding that I now have and that I have thereafter seen in my many travels to other countries. Thank you, God, for having shared such a wonderful human being with us, even though I wish you would have let us have him a little longer. I know I am selfish in this regard, but we miss him already. I too was moved by the memorial in Mieh-Mieh. It was a honor to meet your father, and it is easy to see the impact of his life on so many others. It is a true testament to a great man and the love and respect others have for him, and he has for others. He will be greatly missed, and I will regret not having known him more deeply. Uncle Elias, wow, what a man, what a life. I will forever remember this truly unique man. And his time that he gave to each human he encountered to speak with and to listen and to share a kind word always. The story posted by Leila concerning the domed roof on the church is classic Elias. A domed roof with no supports?! Surely it will fail and crash in and hurt people and dishonor his family. Certainly all of this will happen! How can such a dome stand on its own without visible support? Because it is, by natural shape and design, strong from within and cannot be brought down by weaker forces. This, Uncle Elias knew, and he challenged the church goers to have faith that the roof would work and that it would stand. And so it did. Thank you for sharing the story of your father's life. What a wonderful legacy he has left to his family. Dear Leila, Khalil, and my Sister, Mary Edith, wife of Elias Abu-Saba - No words could ever summarize our life experiences we shared with Elias and Mary Edith and all his extended family. At first, when they lived in nearby North Carolina, and sponsored numerous relatives coming to this country, we even knew them one by one and by name and recognition. After a time, as our own family grew, it became more and more difficult to know and remember them all! Elias was instrumental in bringing many of his relatives from Lebanon to our country to be educated and begin careers and pursuits of their own. Elias was part of our own family for over 45 years, and we looked forward to every meeting and event we shared with him and his family. And to think, I have known him longer than Leila and Khalil have! I was even 3 months pregnant with baby Stephanie (commenting above) when I was "matron of honor" in their wedding in 1961! Our most cherished times were when they lived nearby in Blacksburg, VA, while he attended VPI&SU, and we celebrated the births and rearing of our 4 children, 2 to each of us (Leila, Khalil; and Bart & Stephanie to us). It was Elias who introduced us to Lebanese foods such as hummous, tabbouli, baked kibbeh, baklava, etc. that we had never heard of before but still today look forward to the rare times that we can sample them and remember him. The very next day after we returned to Virginia from California, we got word from Mary Edith that her beloved Elias had died. I am certain that he waited until our "Sibling Sizzle/Kissen Kuzzens" Celebration was over to depart this life, as he had looked so forward to having this event go on even though we offered several times to postpone or cancel the trip due to his illness. So I will personally take part of the credit for his holding on so long and having such a grand celebration with his family members and friends till the end of his time on this earth. After all, it all started out as my own birthday celebration of the "Sibling Sizzle" and then on to the "Kissen Kuzzens" as more family members participated (I counted 28 in all?) and so on to the "Hope Celebration" of his own life. What a grand exit he made for all of us to remember!! So much more could be said; suffice it to say that we loved Elias and will miss him very much. He will forever reside in a special corner of our hearts. Dearest family - and one non-related reader - thank you so much for these comments. It's such an honor that you all contribute your thoughts. The "blog" format is so powerful because people can talk back to the writer, and these responses deepen and expand upon the original post. Thank you, thank you. Lark - Dad designed the solar array for the space station. It was retractable, if I remember. He used a computer to calculate how the station's orbit would change with the array arm extended. I'm sorry he's not around for me to ask him for more details. Edward, Randy, Bart, Susan, Stephanie, Lark - I am so grateful for your words. Thank you.